More and more people are becoming aware of the dangers of legionella, the bacteria that causes the potentially fatal Legionnaires’ disease. But legionella isn’t the only water-borne bacteria that can be dangerous and that people should be aware of. Other water borne pathogens that are now causing concern, especially in healthcare environments include Pseudomonas, Mycobacteria and Stenotrophomonas maltophilia. In this article we take a look in more detail at Pseudomonas aeruginosa, routes to infection, symptoms and treatments. Pseudomonas aeruginosa is a bacterium that can be found in stagnant water and soil. It is able to survive in harsh environments, and as a tough bacterial strain can infect both plants and humans. Although it doesn’t usually cause problems in healthy people, if infected pseudomonas is what is often called an opportunistic organism, which means that if someone’s immune system is weakened in some way, it can have serious, life-threatening consequences. Pseudomonas is an opportunistic organism and for some people, infection can have serious, life-threatening consequences. It represents a real threat to those people whose health could be classed as vulnerable. This includes cancer patients, people with chronic diseases, burns victims and premature babies in neonatal units. What does Pseudomonas aeruginosa do? The type of illness that pseudomonas causes depends upon how it enters the body. This is often the case in hospitals, where patients catch the disease through the use of breathing machines, such as cystic fibrosis patients, and can cause pneumonia. This can cause people to suffer dangerous pseudomonas infections of the urinary tract, bone and blood. This is also the case when the bacterium enters the body through catheters or IV needles. Pseudomonas aeruginosa bacteria can also be present in swimming pools, spas and hot tubs, and can cause skin rashes and swimmer’s ear (Otitis). If contact lenses aren’t looked after properly and kept sterile, then the Pseudomonas aeruginosa bacteria can cause serious infections of the eye. Typically Pseudomonas aeruginosa symptoms depend on where the infection is located. In a wound, you may find green-blue pus in and around the wound or burn. If the infection has caused pneumonia, you may well find you get a cough, and with swimmers ear you may find yourself suffering headaches. For infections elsewhere in the body, fever is common as is lethargy. What all Pseudomonas aeruginosa infections have in common however is the fact that they can make you very sick if they get into your bloodstream and spread that way (septicemia). Serious infections such as this can cause shock, confusion, chills and high fever. How much of a problem is Pseudomonas in our hospitals? 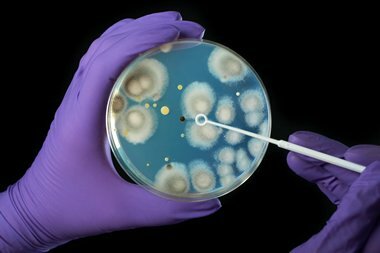 The fact that Pseudomonas aeruginosa is a high priority for hospital infection control departments shows that it has the potential to be a serious problem for hospitals. There have been a number of outbreaks at hospitals in the UK, with the source often being traced back to water that has become contaminated in drains and sinks. With the ability to survive for several days on surfaces, combined with the severity of its symptoms, Pseudomonas aeruginosa remains a pressing issue for all healthcare environments, with between 3700 and 4000 cases per year being reported to the Health Protection Agency. Rates were higher in the Greater London area, with the majority of cases affecting the elderly and babies under one year of age. Pseudomonas aeruginosa, once established in a vulnerable patient, requires immediate treatment as it is potentially a very severe problem. Whilst mortality rates depend upon where the infection is located and how soon it has been identified and treated, some studies suggest that up to a third of infected patients may die. Although the Pseudomonas aeruginosa bacterium does seem to have an inbuilt resistance to antibiotics, there are still a number of drugs that can tackle the bacteria. As experts in the risk management of legionella and other water-borne pathogens such as Pseudomonas aeruginosa, Mycobacteria and Stenotrophomonas maltophilia we can help you devise a comprehensive Pseudomonas risk assessment and on-going management plan including City & Guilds accredited training.